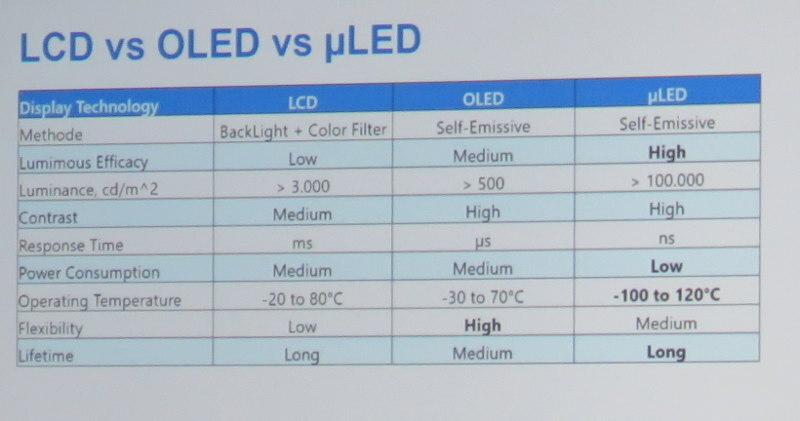 During a presentation at SID Displayweek 2018, laser developer Coherent showed a nice chart that summarizes the performance difference between LCDs, OLEDs and Micro-LED displays. 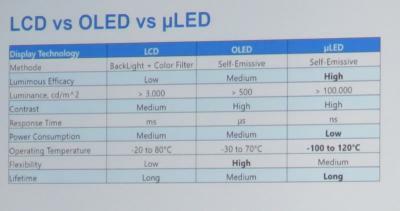 Coherent says that its lasers could be used in the pick-and-place process when making micro-LEDs. A laser lift-off process (LLO) removes the LED chips from the sapphire growth wafer (or any other carrier wafer) and a the laser-inducted forward-transfer (LIFT) process transfer selected dies from carrier to substrate in a high-precision way that can be massively parallel (over 25,000 dies per shot).